Graeme Dey MSP visited Arbroath Delivery Office to see first-hand the operation of delivering Christmas post and to pass on early Season’s Greetings to its dedicated, hardworking staff. 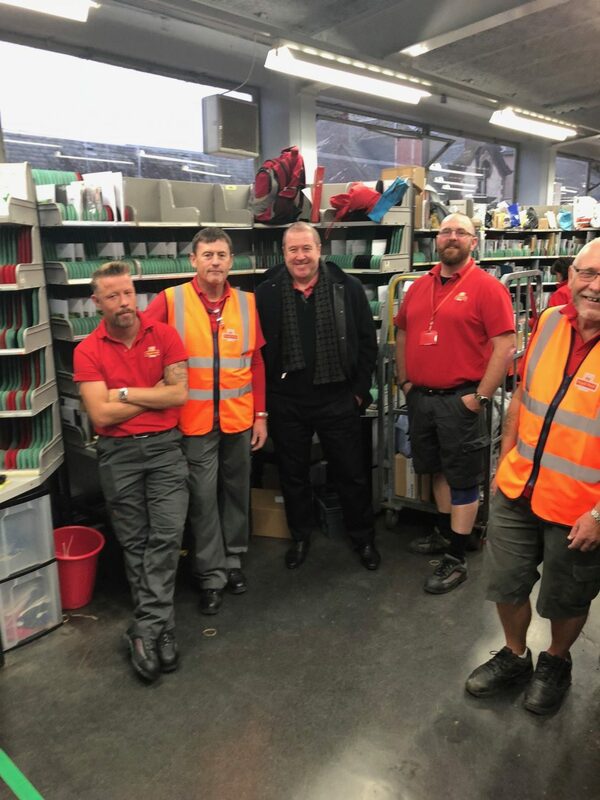 Graeme was shown around the office by Delivery Office Manager, Raymond McCallum, and was introduced to the postmen and women, who will be pulling out all the stops to sort and deliver mail in Arbroath in the forthcoming busy Christmas period. Graeme Dey MSP said: “The coming Festive time will, as ever, see our post men and women working flat out on our behalf making sure our cards and presents reach their destinations. A huge amount of effort and dedication goes into delivering a first class Christmas all over the country but nowhere more so than across the towns and rural parts of Angus. Raymond McCallum , Royal Mail Delivery Office Manager, said: “Our postmen and women will be working extremely hard to deliver Christmas parcels, cards, letters and parcels to people in Arbroath. We are grateful that Graeme visited the office to see our operation and to support the team.